AGUA CALIENTE, Guatemala (Reuters) - Several hundred Honduran migrants in a new U.S.-bound caravan crossed into Guatemala on Tuesday, as U.S. President Donald Trump seized on news of the advancing group to try to build support for a wall along his country's border with Mexico. About 200 Hondurans presented documents in the morning to pass through the Agua Caliente border crossing separating the two Central American nations. The group included entire families and young men, plus parents carrying small children. "Those who (lack documents) will be turned back," said Alejandra Mena, a spokeswoman for Guatemala's migration authority. 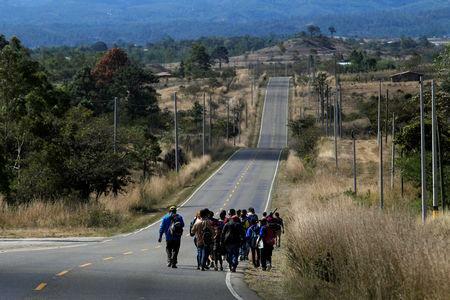 A second group of about 300 Honduran migrants walked along a highway and expected to reach the same border crossing on Tuesday night, activists said. 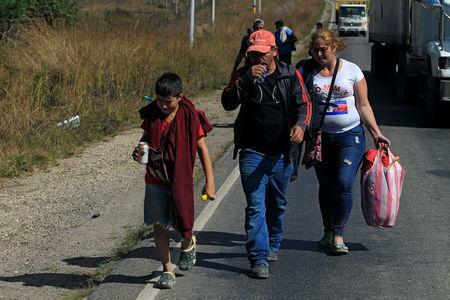 Earlier on Tuesday, Honduran Deputy Foreign Minister Nelly Jerez told reporters that the caravan at the border numbered between 800 and 1,000 people. As a partial U.S. government shutdown reached its 25th day, Trump invoked the new caravan on Twitter to pressure U.S. lawmakers. Democrats have resisted Trump's insistence that Congress provide $5.7 billion for wall funding. "A big new Caravan is heading up to our Southern Border from Honduras," Trump tweeted on Tuesday. "Only a Wall, or Steel Barrier, will keep our Country safe! Stop playing political games and end the Shutdown!" Trump has described the migrants as an invading force and sent troops to reinforce the border last year. On Monday, the Pentagon announced it would extend the deployment of about 2,350 troops to the U.S. border through the end of September. Television footage on Tuesday showed mainly younger migrants leaving the notoriously violent Honduran city of San Pedro Sula. Some flagged down rides to catch up with the caravan that left the same city on Monday. "We're asking them to let us cross on our way to Mexico," said Honduran migrant Josue Hernandez ahead of the checkpoint guarded by Guatemalan police. U.S. Secretary of Homeland Security Kirstjen Nielsen said in a post on Twitter that her agency was closely monitoring the new caravan. "To be clear - participation in a caravan does not grant you a special status or provide you special treatment," she added. About 2,500 migrants from a previous wave of Central Americans who crossed Mexico have been camping in squalid shelters in the Mexican border city of Tijuana. They have "no documents" to enter the USA. KEEP THEM OUT! THEY DO NOT QUALIFY FOR ASYLUM, SHUT THIS PROGRAM DOWN! Hopefully between them and Mexico the herd will be thinned out and made more manageable before they reach our border. Last edited by JohnDoe2; 01-16-2019 at 02:58 PM. New migrant caravan of 1,700 Hondurans heads to Mexico border, set sights on U.S.